Is There Any Problem If I Let My Cat Sleep In Her Carrier? How Can I Make My Cat Sleep Somewhere Else? Why Do Cats love To Sleep With Their Owner? Why Does My Cat Sleep Near My Head? Is It Okay To Sleep With My Cat? Is It Ok To Put My Cat In The Bathroom At Night? 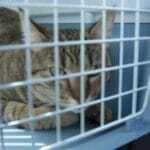 Is your cat sleeping in her carrier? Are you worried about that? 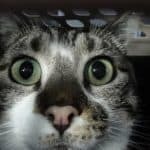 In this article, I am going to give you a complete explanation of your cat’s this kind of behavior. So, let’s get started! Carriers are mostly used for carrying cats to the vets. Cats don’t like vets. So, they associate their carrier with something that makes them unhappy. So, it becomes obvious to hate the carrier. A carrier is a foreign place to her. She has not been acclimated to her carrier properly yet. So, she avoids the alien space and strolls around her comfort zone. Cats always prefer small places. They like being cramped in a tight warm space that is dark. It is because they feel secure in such a place. A carrier meets all these criteria. The carrier is not a foreign place to your cat. In fact, she loves the carrier! She has been acclimated to the carrier properly! Absolutely not! 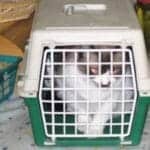 In fact, it will save you from a ton of hassle like forcing your cat into the carrier, make your cat like her carrier etc. So, there is no need to worry at all. Cats love their owners and their owner’s smell. Have you ever noticed that whenever you got up from a chair, your cat has jumped on to it? This is because your smell makes her comfortable and secure. The key to making your cat sleep somewhere else than the carrier is to use your smell. If you are using a cat bed, then just put the cat on your bed for a few days. Your cat will eventually sleep on her bed. First, whenever you are ready to sleep, put a blanket below your head (above the pillow). You can do it for a few days so the blanket gets heavy with your smell. Now put the blanket in the desired spot you want your cat to sleep. She should start sleeping there quickly. This process will only work provided that your cat completely trusts and loves you. This experience was with my very first cat, Boltu. She loved to sleep on my lap. I always work on my laptop while folding my legs on the bed. So, it creates a tight little gap between my legs. I hope by now you are completely aware of why your cat is sleeping in her carrier. There are some other interesting questions about cat’s sleeping. These questions might interest you! Cats love their owner and feel comfortable around them. Cats love to sleep where they feel comfortable. Cats feel secured when they are around their owner. As I told earlier, cats love their sleeping place to be warm. The heat from the owner’s body is very lucrative for cats. Also, the blanket that the owner use provides extra security, comfort, and warmth. For these reasons, cats absolutely love to sleep with their owner. You should feel lucky when your cat decides to sleep with you. It indicates that your cat completely trusts you, likes you and loves spending time around you! I already have said that cats love warm places. Comparing to other body parts, the most amount of heat is lost through the head. Simply for this reason, cats like to be around your head. When you are sleep, which part of your body you move the least? Obviously, it is the head! Unlike hands or legs, we rarely move our head when sleeping. So, cat’s find our head a good stable place for sleeping. This will create a more intimate bond between you and your cat. The more time your cat spends with you, the stronger the bond will be. The heat shared from you and your cat will benefit you both and make you both comfortable. Cats are a great way to relieve your stress. I have found that no matter how much worse my day was, whenever I am with my cat on my bed, I start to feel relaxed and calm. Cat’s generally don’t keep their feet clean. They are always outside. So, when they jump on your bad, their feet may bring dirt and mud from outside (or even from the litter box). Cats don’t sleep as we do. They wake up a lot of times throughout the night. Whenever they are awake, they’ll always try to wake up their owner. I personally had to face this situation every night! Whenever my cat was awake 3 am in the night, she used to lick my feet to wake me up! For some people, cat hair can cause allergies. If your cat is sleeping with you, then there’ll always be cat hair lying on the bed. If you are allergic to cat hairs, then sleeping with cats will never be a clever thing to do. So, here are the pros and cons laid before you. I personally like to sleep with my cat and don’t give a damn about the dirty feet. Sleeping with my cat makes me happy! The bathroom must be warm. At least, put a warm bed for the cat in the bathroom. Make sure the bed has enough blankets to keep the cat warm. Put the litter box inside the bathroom so your cat can relief herself whenever she is awake at night. It is also a good idea to put a water bowl with drinking water and some toys in the bathroom so that your cat doesn’t get bored whenever she is awake. 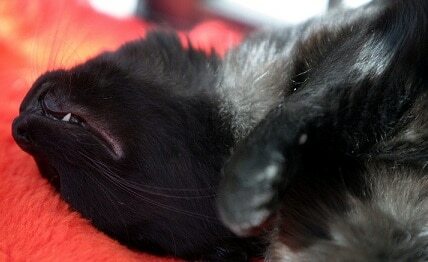 Does your cat show any weird sleeping behavior? Don’t forget to share with us in the comment box below!